This year’s race does not hesitate to send the peloton into the high mountains early on in the grand tour, challenging them with a 158.5km stage from Prades Conflent Canigó to Andorra La Vella, featuring a total of three categorised climbs. Ascending immediately from the start, the bunch will begin climbing the Category 1 Col de la Perche, a 19.5km long rise which averages a gradient of 4.8%. Having reached the summit of this early climb, the route begins to gradually drop downwards, eventually placing itself at the foot of the day’s second Category 1 climb; the Coll de la Rabassa. Likely to impact strongly upon the day’s eventual outcome, the 13.3km climb averages 6.8%, though the ramps of double digits which hit 15% could put some in trouble. From the top a fast descent is expected, the frontrunners hammering it to be first to the start of the final climb on Stage 3, the Category 2 Alto de la Cornella. Lasting for only 4.3km, the 8.6% gradient could be ridden at such an intensity that we see some serious fractures occur in the bunch, where only a proficient descent into the finish could close any dangerous gaps. Omar Fraile could choose to launch his bid for the mountains classification today, riding aggressively on a fitting course to collect points and push onwards to eventually taking the stage itself. He has previously taken victories from similar stages by attacking from a breakaway which has set the pace all day, as well as riding aggressively late on to break up the main bunch. 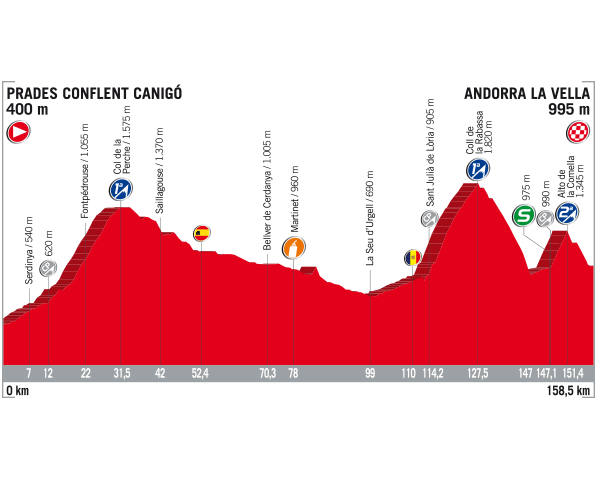 Regardless of his overall ambitions at La Vuelta this year, Stage 3 is an ideal opportunity to gauge how realistic those hopes are. Julian Alaphilippe is another rider who has all the attributes to perform well during a stage like this, possessing the skills to win from almost any situation, assuming he is at the front of the race. Yesterday suggested that the Frenchman has arrived in convincing form for this contest, no doubt making him an even greater marked man than would normally be a given on such a stage. Dangerous from either a small group or solo move late in the day, anyone who hopes to win Stage 3 will need to keep Alaphilippe on a tight leash, as he could prove unstoppable if given the room to attack. Adam Yates has been reunited with his twin brother for this grand tour, which shall surely mean we see plenty of moves from the two British riders to animate the race throughout the three weeks. Today’s offering might be enticing enough to lure Adam into action, perhaps placing himself within the day’s main move and seeking to push on solo or with an elite group of riders in the closing kilometres. The final climb of the day looks to be an obvious springboard for him to make an attack, whether from the peloton or an earlier break, aiming to descend rapidly and finish off any remaining rivals in a sprint to the line. Rui Costa enjoyed a strong start to the season and perhaps deserves to have picked up a greater number of wins, given such sparkling form for most of the year. The former World Champion could chance his luck in a breakaway, hoping to be part of a small group which decides the stage honours for the day, as he shall be confident of being one of the fastest present in a sprint. A larger group is bound to diminish his hopes of winning, thus the Portuguese rider will need to be proactive in order to give himself a shot at the win. Giovanni Visconti will be a dangerous prospect if handed the chance to attack on Stage 3, especially on terrain which is well within his capabilities of performing strongly upon. Team orders could limit his freedom to pursue stage winning opportunities, though by tactically choosing to place him up the road early in the day, Visconti could benefit from a dynamic which limits his need to invest energy; allowing him to give it everything over the final two climbs to attack solo. Other riders worth watching out for on Stage 3 are Luis León Sánchez, Darwin Atapuma, Jarlinson Pantano, Rohan Dennis and Michael Woods. Posted on August 20, 2017 by Spokenforks	This entry was posted in La Vuelta a España 2017 and tagged Adam Yates, Darwin Atapuma, Giovanni Visconti, Jarlinson Pantano, Julian Alaphilippe, La Vuelta a España 2017, La Vuelta a España 2017 Preview, La Vuelta a España 2017 Stage 3 Preview, Luis Leon Sanchez, Michael Woods, Omar Fraile, Rohan Dennis, Rui Costa. Bookmark the permalink.